Signode has launched a new range of PET (polyester) strap called Signode Platinum. Locally manufactured in Derrimut, VIC Signode’s Platinum range is manufactured using new and innovative processes designed to provide superior strapping solutions for a wide range of medium to heavy duty applications. Signode Platinum PET (polyester) strap is available in a variety of sizes and is designed for both manual and machine operated applications. It is highly suitable for use with a wide range of battery operated hand tools such as Signode’s BXT2 hand tool. 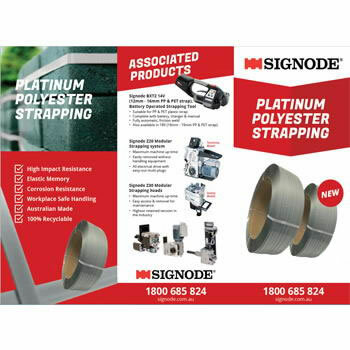 For further information on Signode’s range of Platinum strap, contact Signode sales on 1800 685 824. 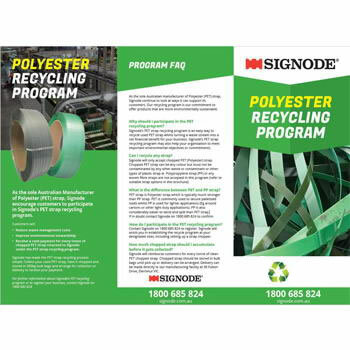 As the sole Australian Manufacturer of Polyester (PET) strap, Signode encourages all PET plastic strap uses to participate in this exciting new, first of its kind recycling program. Taking part in the recycling program will enable PET strap users to reduce their waste management costs and improve their environmental stewardship. Further still Signode will accept chopped PET in return for a cash rebate for every tonne delivered to its Derrimut facility in Victoria. For further information or to participate in Signode’s PET recycling program contact Signode on 1800 685 824. 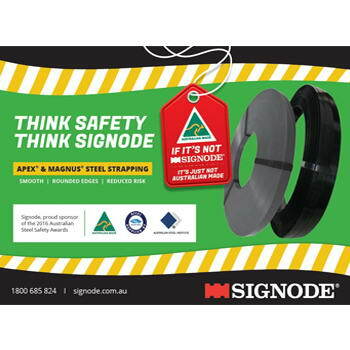 Signode is an Australian manufacturer of steel strapping solutions. It’s Kurri Kurri, based facility near Newcastle in NSW provides Australian and New Zealand customers with reliable and consistently manufactured steel strap. Using Australian best practises and 100% Bluescope steel Signode’s steel strap provides customers with peace of mind for load containment of light, medium and heavy duty applications. As an Australian manufacturer Signode partners with the Australian Steel Institute to promote safety within the steel industry. Sponsoring the 2016 Steel Safety Awards enabled it to highlight the benefits of using its own Australian made Apex, HSA & Magnus products which are all deburred during its manufacturing process intern providing customers with smooth rounded edges which reduce OH&S risks associated with the use of steel strap. For further information on Signode’s range of steel strapping solutions, contact Signode sales on 1800 685 824. 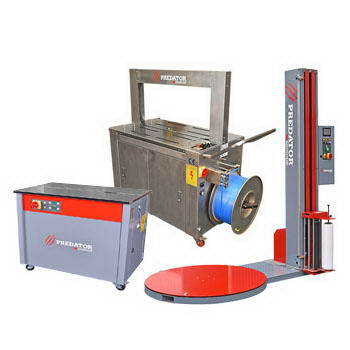 Signode has launched a new range of general purpose pallet wrappers and strapping machines. On the back of extensive market research and customer feedback Signode has developed a NEW operator friendly entry level pallet wrapper designed to improve operator safety and ease of operation when it comes to wrapping pallets. Signode’s new Predator T2 comes loaded with safety features like the automatic film tearing device eliminating operators from using knives and a crush prevention device under the film carriage. With a controlled touch LED display, the Predator 12 will handle a maximum payload of 2000kg and wrap as high as 2.1 metres. Signode also provides customers with a 24 month warranty, touch screen LED control panel display, dual multipurpose film sensor and precise tension control. The range also includes 2 new strapping machines, an entry level closed cabinet table top strapping machine and a fully stainless steel, highly reliable and feature packed automatic strapping machine specially engineered for the meat, poultry and fish packing industries. Or to speak to a member of our sales team contact Signode sales on 1800 685 824. 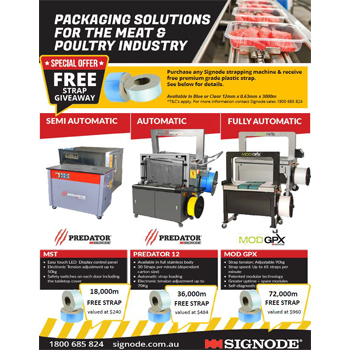 Signode's FREE STRAP GIVEAWAY with every Predator Strapping Machine purchased. For further information on free strap giveaway promotion contact Signode sales on 1800 685 824. 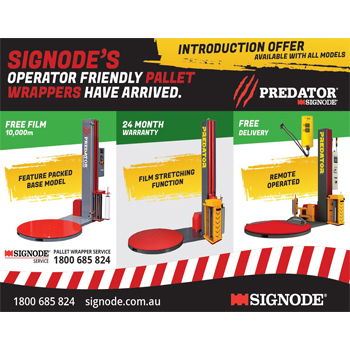 Signode's FREE FILM GIVEAWAY with every Predator Pallet Wrapper purchased. For further information on free film giveaway promotion contact Signode sales on 1800 685 824.